Geoff Hansen has been a photographer since he was 13 years old, growing up in South Dakota. 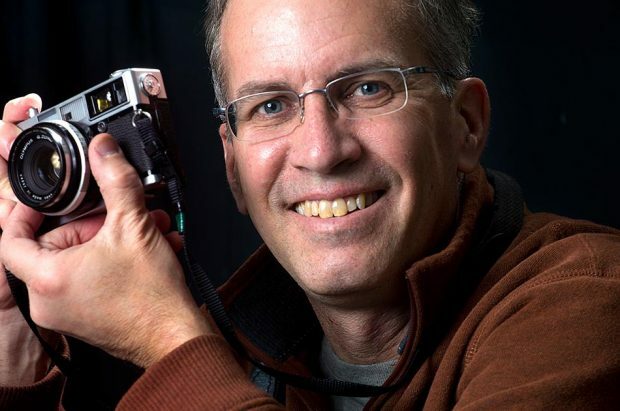 He studied photojournalism at the University of Minnesota, Minneapolis, and has been photo editor and page designer at the Valley News in Lebanon, N.H., since 1998. His approach to his work is marked by respect for the subject, gentle humor and letting events play out naturally in time. He doesn’t stage or pose pictures but uses a photojournalist’s techniques and instincts to capture the joy, drama and unpredictability of life. “It’s a combination of emotion and light, and trying to tell a story in a single moment,” Geoff says. His photographs have been awarded first place by the New England Associated Press, and have been published in Newsweek, USA Today, the New York Times, the Boston Globe, Vermont Life and Farm & Ranch Living Magazine. His photography has appeared in 14 books, and he has been the lead photographer on ten books, including My Life as a Dog, the best-selling Living with Chickens, Harvest: A Year in the Life of an Organic Farm, Barbie Unbound, and most recently, The Joy of Keeping a Root Cellar. His photographs have also been exhibited throughout Vermont, including a one-person show at the Agency of Agriculture in Montpelier, Vermont. Geoff has had the privilege of photographing more than 200 weddings throughout New England since 1994. He is also a webmaster, and has designed and maintained over two dozen websites, including such mystery writers as Sarah Strohmeyer, Sarah Stewart Taylor, Entertainment Weekly columnist and author of Pictures at a Revolution Mark Harris, playwright Deborah Salem Smith, and doctor and author Christine Montross, among others. Using photography to map and foster community is also a part of Geoff’s work. He has organized A Day in the Life exhibitions in towns around Vermont. Valley News – West Lebanon, N.H. In charge of three photographers, responsible for planning and implementing the visual report for news, feature and special sections of the 14,000 circ. daily. Coordinate coverage with editors and reporters, involved with projects, edit staff and wire photography and attend news meetings for planning and budgeting photographs, graphics and illustrations. In addition to designing centerpiece news features, layout the daily front page and at least two weekly photo pages. Research and write capital expenditure requests and budget proposals. Create and download spot news graphics. A “super user” for two Content Management Systems — DTI in 2013 and Miles-33 in 2015. Involved with training others in the newsroom. Coordinator of coverage between ten reporters and four photographers. Responsible for planning the day’s news budget, assigning stories and giving advice to writers through the reporting process. Meet with other editors to decide how the readership is best served in news coverage. Responsible for hiring, training, scheduling and motivating two full-time staff photographers and a year-round intern. On a three-person staff, responsible for all areas of newspaper photo coverage. Switched to C-41 color with morning publication in April 1993. The Patriot Ledger – Quincy, Mass. Responsible for daily assignments at the 90,000 circ. p.m. daily. Kalamazoo Gazette – Kalamazoo, Mich. Photography of daily assignments at the 63,000 circ. p.m. daily. The Minnesota Daily – Minneapolis, Minn. Responsible for shaping photographic coverage with newsroom staff. Picture edit twice weekly, hire and train photographers on the twelve person staff, draft budget requests and coordinate major photo equipment purchases for the university’s student-run 45,000 circ. daily. Worked as Assistant Photo Editor (4/87-3/88) and Staff Photographer (10/85-5/89).